Abba Tribute band ABBAMANIA is one of the UK’s original ABBA Tributes and is widely regarded as one of the UK’s and Europe’s premier Tributes.Their sensational LIVE concerts have taken them all over the World to great acclaim.This fabulous look-alike band takes you on a musical journey through the fabulous catalogue of the greatest hits of ABBA. Recreating in meticulous detail some of the top dance floor fillers ever recorded. Book ABBAMANIA and re-Live the magic that was ...ABBA. After winning the Eurovision Song Contest in 1974, ABBA gained immense international popularity, employed catchy song hooks, thoughtful lyrics and a wall of sound. As their popularity grew, they were highly sought-after to tour Europe and North America, drawing crowds of near-hysterical fans. They remain a popular fixture in radio play-lists and are still one of the world’s best selling bands, having sold almost 400 million records worldwide. 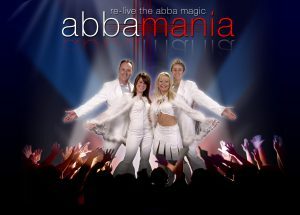 ABBAMANIA was formed in 1998 and is now recognised as one of the most authentic ABBA tribute bands in the UK. ABBAMANIA hit ‘GOLD’ with their re-creation of ABBA in Concert, and will have you dancing in the aisles with their fabulous LIVE show featuring nearly two hours of pure ABBA nostalgia! Don’t miss this Tribute to one of the world’s greatest bands-ABBA!